Airport information system is referred to a system which is used to manage airport operations. Flight information display system (FIDS), is widely used by numerous airports due to the system helps the passenger to get the information about their fights. It displays information to the public in a format selected by the airport. The global airport information system market is expected to grow at a CAGR of 7.2% over the forecast period i.e. 2017-2024. Further, airport information system market is anticipated to reach USD 49.8 billion globally by 2024. Further, the market of airport information system is riding on the back of various factors such as growing importance of self-service airports and increasing IT spending on airports. On the basis of solutions, the global airport information system market is segmented into flight information display system (FIDS), resource management solutions, public address systems, baggage processing, passenger processing, airport operations, airport information, and airport operational database (AODB). Further, the baggage processing segment is expected to dominate the overall segment by the end of 2024. Likely, this growth of baggage processing segment is attributed to increasing demand for proper baggage management. On the basis of regional platform, the most prominent regional markets include North America and Europe. North America region is expected to dominate the market during the forecast period aided by U.S. Further, rising technological advancement in airport information system and increasing research and development in the field of aviation sector are believed to bolster the growth of airport information system market in this region. Europe region captured the second largest market of airport information system in terms of revenue in 2016. 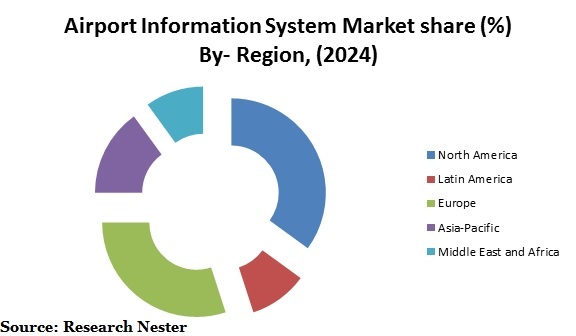 Further, Western Europe countries such as U.K., Germany and others are the major contributors of airport information system market owing to rising number of air travelers. Factors such as rising number of air travelers, rising demand for automated and self-service processes and expansion of aviation industry are believed to be the dynamic factor behind the rapid growth of airport information system across the globe. Moreover, increasing penetration of smartphone-enabled solutions is also bolstering the growth of airport information system market by the end of 2024. Furthermore, rapid urbanization coupled with positive GDP figures of developed and developing nations is envisioned to boost the growth of airport information system market. In addition to this, technologically advancement in airport display system to manage the passengers properly and rising IT investment on airports are predicted to supplement the growth of airport information system market. However, lack of integration of airport information systems in underdeveloped nations is envisioned to hinder the growth of airport information system market across the globe. Moreover, high cost associated with the implementation of airport information system is expected to hamper the growth of airport information system market over the forecast period.